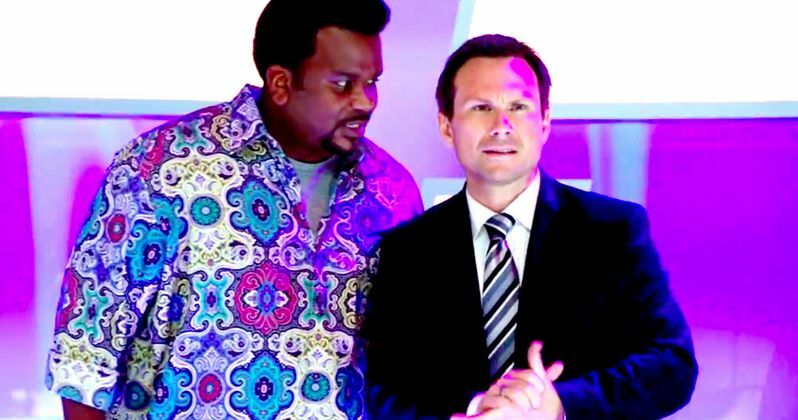 Nick Webber (Craig Robinson) finds himself on a bizarre game show entitled Choozy Doozy, hosted by Christian Slater, in a new red band clip from Hot Tub Time Machine 2. As you likely noticed in the previously released trailers and clips, Nick has become a pop star in the future, ripping off songs from the past and making them his own. This fame and fortune eventually leads him to appear on Choozy Doozy, where members of the audience choose crazy things for the guest to do. Unfortunately, Lou (Rob Corddry) has a hilarious idea for Nick, although the tables get turned quickly. Original Hot Tub Time Machine director Steve Pink returns to take the helm for this sequel, which co-stars Gillian Jacobs, Thomas Lennon, Chevy Chase and Collette Wolfe. Take a look at this age-restricted scene, which features R-rated language, before Hot Tub Time Machine 2 hits theaters February 20.